Cosmetic treatments for men are becoming more popular at Cityskin. A review of the number of men attending our clinics in 2013 and 2018 shows that the percentage of men attending has grown from 11% in 2013 to 17% in 2018. Why the change? Who are the men having cosmetic injectables at Cityskin? Men noticing lines / wrinkle on their social media photos and seeing themselves on Facetime. Which treatments are men having at Cityskin? In 2013 the majority of male patients attending Cityskin were having anti-wrinkle treatments with a smaller proportion having dermal fillers. In 2017 we introduced double chin injections at Cityskin – a permanent solution for removing double chin fat. Almost a third of our patients having double chin treatments are men. I think that there is still a stigma around men having cosmetic treatments. Plucking a mono-brow is socially acceptable, as is designer stubble and hair product but aside from these things every other beauty treatment still seems socially taboo for men. As a male we don’t want to be seen to be making too much of an effort – we don’t want to seen as the man desperately trying to look younger or caring too much about to their appearance. I always ask patients who come in for a consultation whether they have told friends, family or partner that they are considering having treatment. I also ask patients whether they would like a very subtle treatment so nobody but themselves will notice or a more impressive result where people may comment on a change. Either way, our core belief at Cityskin is ‘Fresh, not fake‘ and this underpins every treatment that we offer. 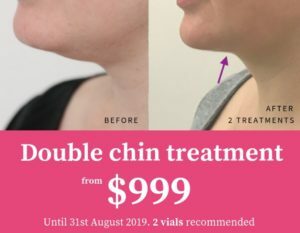 Double chin treatments have been a game changer for men. Finally there is a cosmetic treatment available with minimal downtime which will keep friends, family and colleagues guessing.